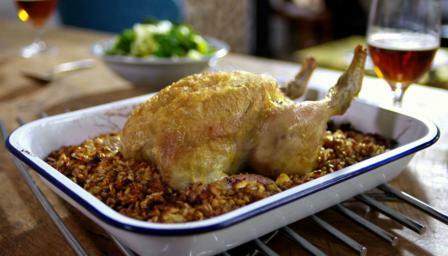 Fruity spelt brings an inventive twist to classic roast chicken in this dish. Serve with kale and leeks for a healthy Sunday roast. This meal, if served as six portions, provides 520kcal, 56g protein, 46g fat (of which 6g sugars), 12g fat (of which	3g saturates), 4g fibre and 0.6 salt per portion.